With Ballina Town in action in the Connacht Junior Cup against Galway Bohs there was only four games down for decision on the opening weekend. 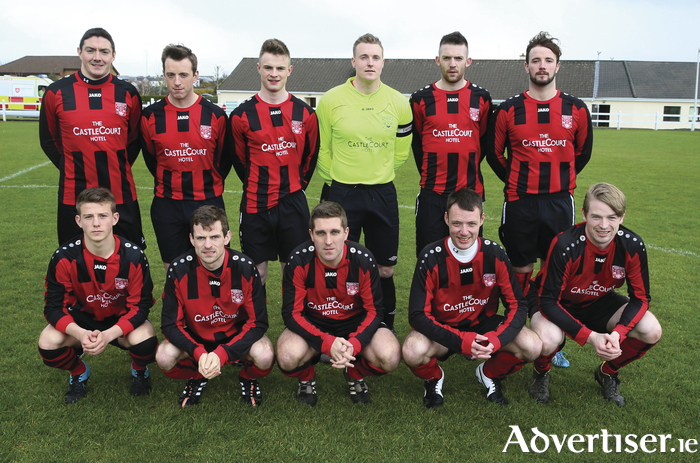 Current holders Westport entertained Super League newbies Glenhest Rovers to the Sports Park on Sunday afternoon. In a closely fought affair, goals from David Hoban and Adam Mulchrone got the Covies off to a flying start in a 2-0 win. Ciaran Kelly and his Castlebar Celtic side travelled to North Mayo on Saturday evening and they gained a share of the spoils in a real humdinger. Anthony Johnston, Ioseph O’Reilly and Jamie Ivers opened their league accounts for the Hoops, whilst Jason Boylan, Tom Ivan and Jamie Flannery were on target for Iorrais in a 3-3 draw. Conn Rangers who survived by the skin of their teeth last season, were defeated 2-0 by a lively Ballyheane side. It was vital for both sides to pick up some early points and the West Mayo side put one over Joe Faughnan’s men with Robbie Elhert and a penalty from Arek Tobiasz sealing the three points. In the tie of the weekend, Ballyglass recorded a comprehensive 3-1 over Manulla. JP O’Gorman, who was on target for the Mayo League side against Galway Utd in the EA Sports Cup opened Ballyglass’ account along with two goals from Liam Hughes off the bench. Swinford had to dig deep on Sunday afternoon to see off a resilient Fahy Rovers outfit in a ding-dong battle. Goals from Ian Price, James Devanney, Peter McNicholas and Paddy O’Donnell proved crucial as the Mayo Mental Health Association Mayo Seven’s Cup finalist’s held on admirably in a 4-3 win. First half goals from Rory Gallagher and Marc McDonnell was enough for Killala to kick-start their league campaign against a highly-fancied Achill Rovers outfit. Straide & Foxford Utd recorded their second win of the campaign on Saturday night, when they defeated Partry Athletic 3-2. Paul Moran added to his league tally along with strikes from Chris Moore and Chris Downey to maintain their position at the summit of the league. Charlestown Athletic dished out a 4-0 hammering to newly promoted Bangor Hibs on Saturday night. Jason Corrigan rifled home from 30 yards inside the opening 17 minutes to get the East Mayo side off the ground, with Bangor Hibs still stuck in first gear. Man of the match Johnny McNulty stretched their lead further, before a quickfire double from Tom Towey wrapped up the three points. Westport Utd ‘B’ bounced back from their 4-0 defeat to S&F Utd last weekend with a 3-1 win over Kiltimagh/Knock Utd on Saturday night. Adam Mulchrone who bagged a goal for the ‘A’ side the following afternoon picked up a brace along with an effort from David Foley. Crossmolina made it two wins from two on Saturday night to stay top of the pile after a hard-fought 4-3 win over Ballyhaunis Town. After falling 3-0 down it was backs to the wall stuff for Crossmolina who somehow managed to pull it out of the fires. Goals from substitutes Derek Sweeney and Nathan Mullarkey drew their side level before a last gasp winner from Kevin McHugh was enough to see them home. Ballina Town ‘B’ recorded a comprehensive 4-1 win over Conn Rangers ‘B’ in a North Mayo derby. Shane Devers bagged a brace along with strikes from Stephen Melvin and Hugh Quinn. Manulla ‘B’ picked up their first three points on Sunday afternoon following their battle royal with Moy Villa. Snugboro Utd jumped to the top of the league thanks to a comfortable 4-1 win away to Ballyvary Blue Bombers. There was a lack of goals in Ballyglass on Sunday afternoon as neither Mulranny Utd nor Ballyglass ‘B’ could break the deadlock in a lacklustre affair.